After churning up outrage this week for minimizing the terrorists who killed nearly 3,000 on 9/11 as just “some people [who] did something, Minnesota Rep. Ilhan Omar is doubling down on her comments by suggesting former President George W. Bush did the same thing, adding that perhaps he would have caught more flak if he "was a Muslim." To make her point - or, rather, fall flat on her face trying - Omar quoted a famous line from Bush in which the former president called the 9/11 terrorists "the people who knocked these buildings down" just three days after the Sept. 11 terror attacks. "Was Bush downplaying the terrorist attack? What if he was a Muslim," Omar suggested, along with a linked article from the Washington Post defending her remarks. 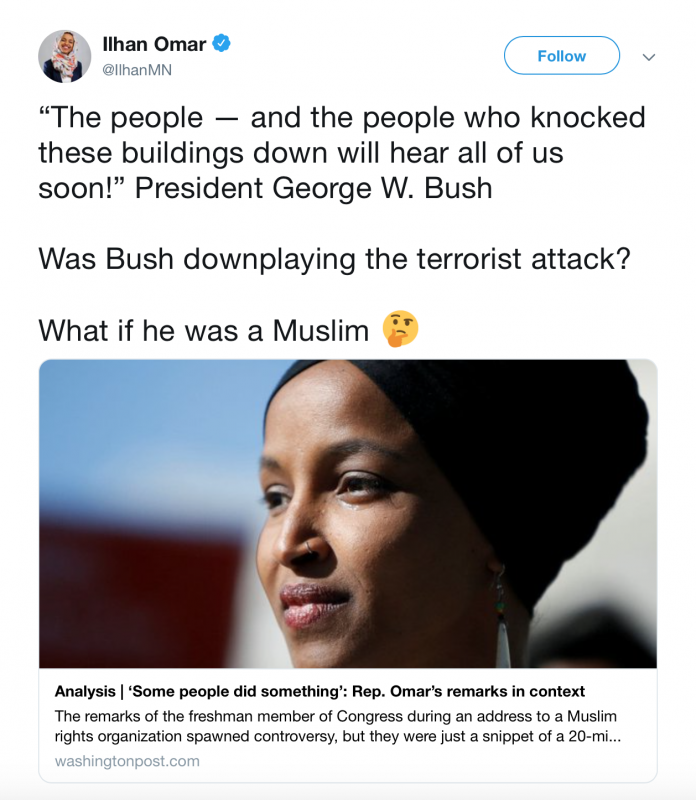 In the tweet, Omar is referencing a patriotic impromptu speech Bush gave while standing atop a pile of rubble at Ground Zero standing next to a New York City fire fighter, in which he pledged to avenge 9/11 victims by going after the terrorists responsible for taking down the Twin Towers. “I can hear you. The rest of the world hears you. And the people who knocked these buildings down will hear all of us soon,” Bush said in the now-iconic moment that's become known as one of the most patriotic and unifying speeches in modern U.S. history. Omar and her fellow progressives, on the other hand, have claimed the outrage is based in "racism" simply because she is a Muslim and a "woman of color."